Kenergy Coffee of Double Instant Espresso is designed to fight overall weakness, fatigue, stabilize the cardiovascular system, blood pressure and may also help heighten alertness, mental acuity, the alpha brain waves, GABA level, immune system, and support stress reduction and promote the quality of sleep. 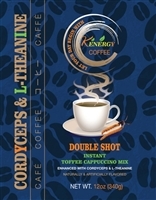 Kenergy Coffee of Double Shot Instant Toffee Cappuccino Mix is designed to fight overall weakness, fatigue, stabilize the cardiovascular system, blood pressure and may also help heighten alertness, mental acuity, the alpha brain waves, GABA level, immune system, and support stress reduction and promote the quality of sleep. 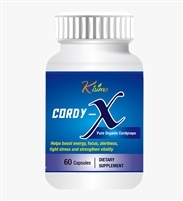 Cordy-X helps boost energy, focus, alertness, fight stress and strengthen vitality. UP-X Just For Men helps support kidney's function and improve sexual experiences. sensitivity & urinary incontinence and could eliminate odors.